How likely are Li-ion batteries to explode? However, a potential failure can arise if—during the Li-ion manufacturing process—metal particles are allowed to contaminate the interior of the cells. Over time, those particles can move into the separator, which is an insulating barrier between the anode and cathode sides of the cell. That creates a short circuit between anode and cathode, allowing electrons to flow freely and quickly, and the battery fails. Most of the time, that failure will consist of little more than the battery powering down and ceasing to function properly. 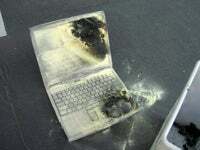 In rare instances, the battery will overheat, then melt, catch fire, or even explode.